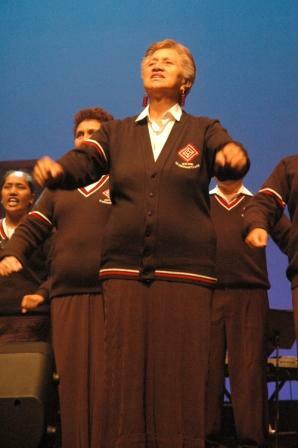 Flooding and storms aren’t enough to stop pakeke (elders) from the East Coast from making their way down to Wellington to perform at Kaumātua Kapa Haka at Te Papa this weekend. Senior Maori performing artists from Te Hokowhitu a Tu have had to leave earlier than planned to dodge road restrictions in the region. The Uawa River flooded and the rain caused road slips in several places. While a few of the kuia (female elders) have decided to stay at home, 25 hardy souls are determined to make sure they get here! The main group of performers left Tokomaru Bay on Thursday afternoon to make it to Te Papa on Saturday morning. 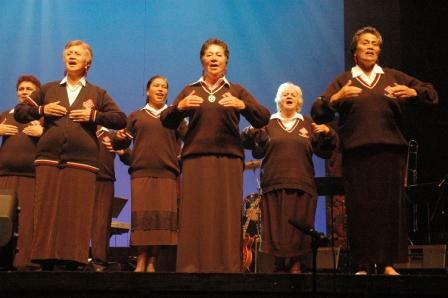 So it’s a two day journey for the keen and dedicated performers from Te Tai Rawhiti. They’ll be joined by around 250 other performers who are coming in from Auckland, Bay of Plenty, Waikato, Hawkes Bay, Wairarapa, Taranaki and Wellington. Te Hokowhitu a Tu has based their bracket on the songs of one of the most popular Maori songwriters of all times, Tuini Ngawai. Many of her songs are dedicated to the 21st Maori battalion and feature Maori lyrics sung to popular Pakeha (Eurpopean) tunes of the time. You’ll be surprised about how many of these songs you know! So proud the ‘cowgirls’ from Ngati Porou didn’t let the wrath of Tawhirimatea on their roads prevent them from celebrating Matariki at Te Papa Tongarewa on Sat and Sun. Too much Coasties I’m looking forward to the rythems and sway of yesterday.